In her latest post, which I read this morning, my blogging friend, Pauline King, https://paulinekingblog.wordpress.com/ reminded me of my flat-share with my friend Giles in Claverton Street i 1973. This was a basement flat in a Pimlico terrace. The enclosed back yard was a small area of concrete. There was no real sunlight. Nothing grew there. The elderly woman next door, however, enjoyed a wonderful ferny garden in what appeared to be rich soil. One day I asked her how she had soil when we had concrete. ‘Oh, I’ve got concrete underneath,’ she said. ‘I put the earth on top’. ‘Where did you get it?’, I responded. ‘From Battersea Park’. She replied. ‘How did you get it here?’ was my next question. ‘In my handbag’, was the answer. This wonderful woman had trekked backwards and forwards – it must have been for years – carting bags of soil trowelled up from this London Park situated on the other side of the River Thames. The times superimposed onto Google’s map probably relate to trains from Waterloo. This heroine walked across Battersea Bridge. Our own efforts at shifting soil today paled into insignificance when compared with that neighbour’s feat. Nevertheless I can offer those up for consideration. 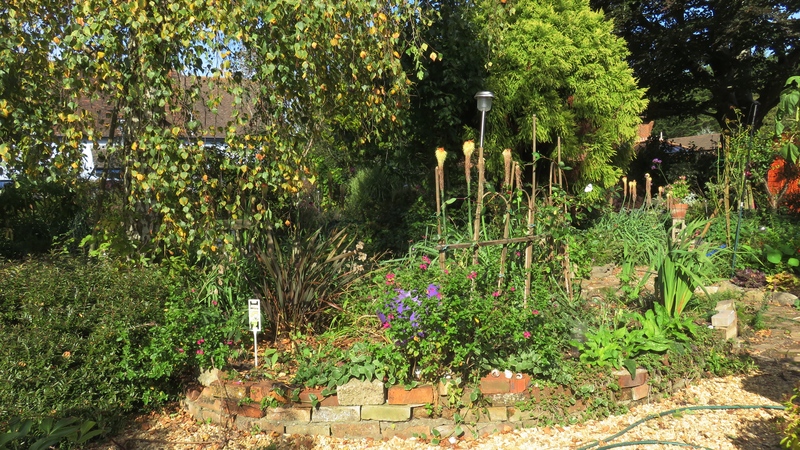 Jackie continued her work on opening up the Weeping Birch Bed; revealing some hidden plants; resetting others; and infilling soil from the excess on the borders of the back drive. 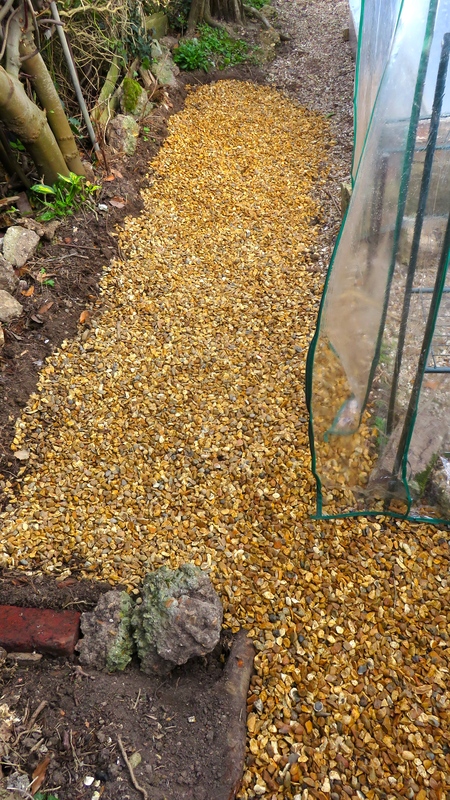 I dug out the soil from the area worked over yesterday; moved that round to the front of the house; collected several barrow loads of gravel from the pile on the back drive; and spread it over the revealed surface, thus widening the path. The transported earth needs spreading, and the left hand side of the path needs edging with stone. Maybe tomorrow. 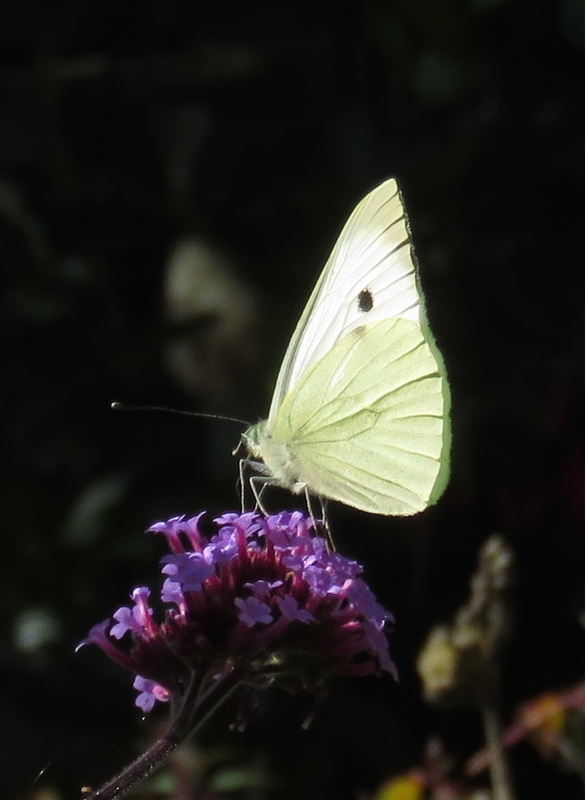 and Small White butterflies, fluttered, flashing, everywhere. Mr Pink’s fish and chips had the honour of providing our dinner this evening. We added gherkins, cornichons, or wallies, and pickled onions. I drank more of the Chianti and Jackie drank more fizzy water. 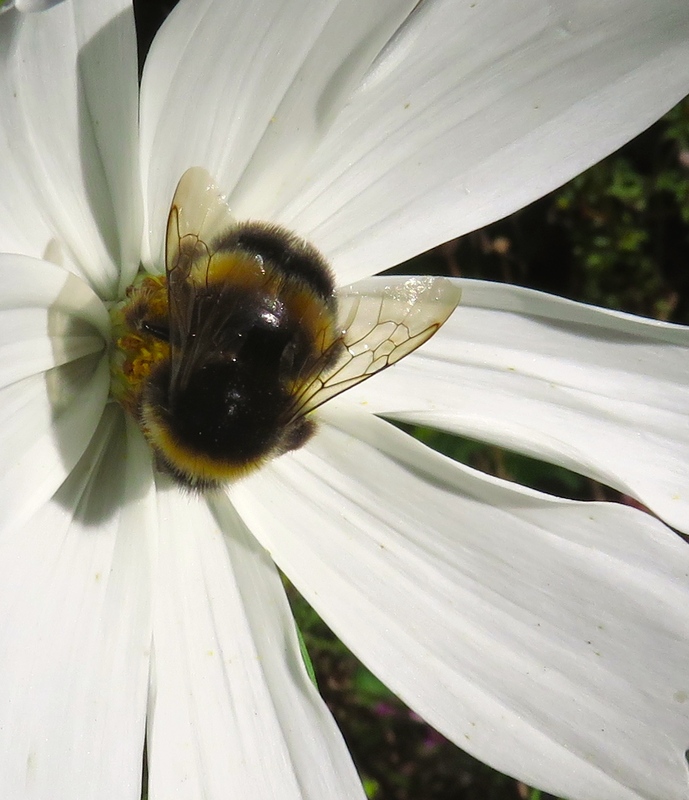 This entry was posted in Uncategorized and tagged basement, Battersea Park, bees, butterfly Small White, Claverton Street, cosmos, paths, verbena bonarensis by derrickjknight. Bookmark the permalink. What a story! Also, lovely pictures. You do work hard and deserve fish and chips. I can only manage a fraction of what you do so it’s just as well my garden is minuscule. Still, I think I’ll have that for lunch today 🙂 I would love to photograph one of my big blue butterflies to share with you but am never quick enough. I am enjoying your fluffy bees – I held one in my palm and stroked its fur once. Thank you Mary. I would like to see one of your butterflies. Amazing that you could cradle a bee. That happened on Whidbey Island, Washington USA when I was awarded a six weeks residency at Hedgebrook. We don’t have bumble bees in Australia as far as I know. What a great story. It always amazes me what ladies can fit into those handbags, and now I’ll have another item to marvel at!!!! One never knows what a lady may be carrying in her handbag. Lovely story, Derrick. Thank you, Cynthia. There was a pop song when we were young, all about a young man waiting to be let in the house by his girlfriend emptying out her hand bag in search of keys. What is the name of the beautiful flower in the first picture? Oh! Oops! That’s Jackie! I’m glad you enjoyed your wallies with your dinner. Truth is odder than fiction they say–what a dirt-hauling, garden-making story. I would wager you have more energy than I– and you seem to get more accomplished that can be seen! Fun read. I laughed so hard at this story of the handbag and the soil transport! How tenacious! Your bees, as I said yesterday, are so endearing. I know they aren’t cuddly, but they do look so. 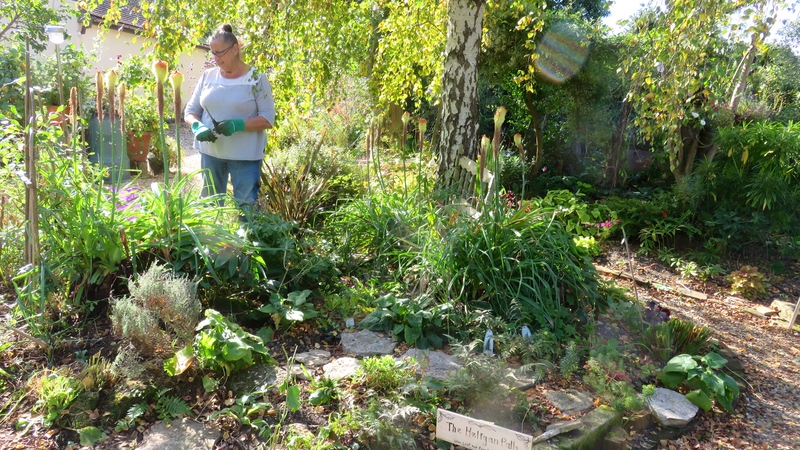 I love that woman and her handbag full of soil – what a character! Loved the story of transporting soil from the park one handbagful at a time! Where ther’s a will, there’s a way. What a determined lady! Such desire! Thank you Timi. Glad you spotted the butterfly. The lady was great; so matter of fact about such an endeavour. Great memory Derrick! If you can’t get to the park, then move the park to you – hang on a minute, this lady did both!…. Amazing! 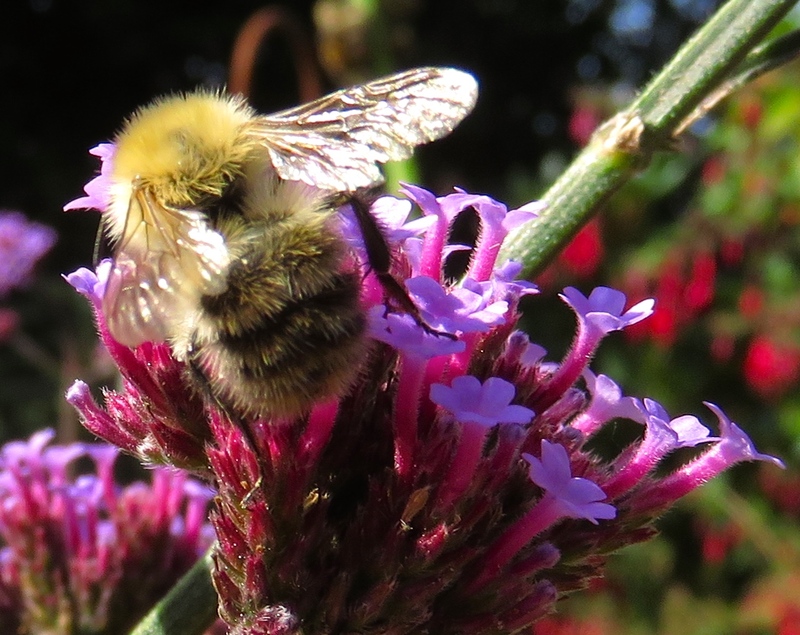 Love the photos of the bees and the garden! Wow! Great story! I can totally relate!